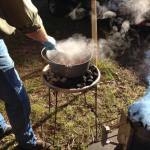 Dutch oven cooking… the penultimate form of camp fire cooking.. has always fascinated me. 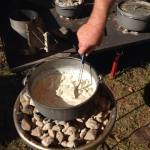 You may have guessed this from an earlier article I wrote on cooking with Dutch Ovens. In any case, cast iron, durable as hell and able to maintain one heck of a non-stick coating, has been around for thousands of years and exists in its purest form when rendering up vittles cooked by someone who knows what they’re doing. 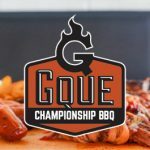 Though this blog deals mainly with BBQ, I feel it makes sense to show some love for other forms of grilling and outdoor cooking. 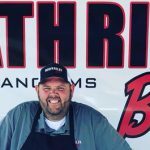 As such, I reached out to Mr. Forrest Dilmore, perhaps one of the most accomplished Dutch Oven cooking professionals on the Florida Bar-B-Que Association competition circuit, to see if he’d be willing to share some of why he loves this form of cooking so much – and maybe give up a few secrets so the rest of us can get rolling with it. 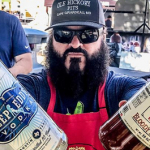 Folks, this is a man who knows what he’s doing where Dutch Oven Cooking is concerned… as Forrest earned Reserve Grand Champion honors at both the Arkansas State Championship and the Texas State Fair this year! 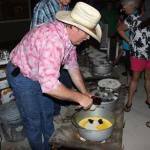 The following is a transcript of Forrest’s answers to some questions I sent him about how he got started with Dutch Oven cooking and how the rest of us might best learn how to cook using Dutch Ovens. 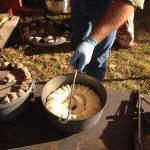 As always, I’ve also included some Dutch Oven cooking videos, links, and resources for how to cook with Dutch Ovens. 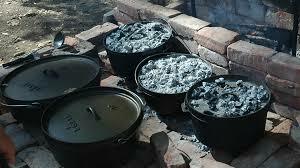 Can you tell us a little bit about your first experiences with Dutch Oven Cooking? You seem to truly love it, so it seems there’s a good story here! 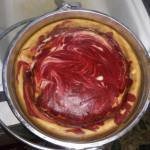 My first experience with Dutch Oven cooking came about many years ago. One day me and my boss was sitting around just talking about stuff, he had been involved with Boy Scouts in the past, and he told me about once in a while on their scouting expeditions somebody would bring a dutch oven and bake a peach cobbler. Well I had never seen anybody do that before, but the whole idea of it intrigued me. One day not long after that discussion, I bought my first dutch oven, one of them notorious impulse buys. I had thought about that cooking process a great deal and just couldn’t get it out of my head. I found a simple peach cobbler recipe…the one where you just use canned peaches and boxed cake mix. 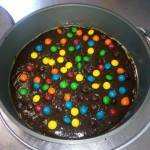 I was so excited to try it out…I got my ingredients up and put it all together and cooked it. It came out perfect…but it was so sweet that I couldn’t eat it and had to throw it away…you talk about a bubble gettin busted! I told my Momma about the mishap and she questioned me about what all I used. I had used white cake mix…cause I like white cake. Momma told me that the extreme sweetness was probably from the white cake mix, that I should of used yellow cake mix. So it was back to the drawing board for me. The next cobbler came out perfect again…but this time it was edible…and I was hooked. I then went on to experiment and try other cobbler recipes, cause everybody likes cobbler. 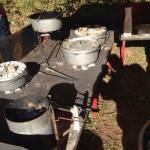 I probably ended up cooking about 40 different cobbler variations and had to have more dutch ovens. There’s two types of people in the world…them what like dutch oven cooking and them what love dutch oven cooking…bless both of’ems heart. Years later, there ain’t too many things that I haven’t cooked in a dutch oven, and if I haven’t I’m certainly not afraid to. I have also gathered up a pretty good pile of cookware! If someone came to you and asked how to get started with Dutch Oven Cooking the right way – from gear to know how – what exactly would you tell them? How would you “show them the ropes,” per se. If somebody was to ask me how to get started in dutch oven cooking I would tell them to just start with some basic equipment and try some basic easy recipes to start with. 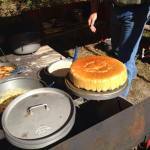 Dutch oven cooking is not hard to do…but it’s not for everybody. I’d say just start out with a basic 12″ dutch oven…a lid lifter….and a pair of good gloves, like welding gloves. That would get them started enough to find out if it was for them or not. Afterwards if they wanted to continue and expand their horizons, they could get into some specialty stuff like cooking tables, inserts, and other equipment. 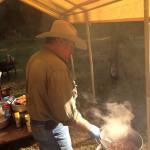 Be Sure to View These Great Photos of Forrest’s Dutch Oven Exploits! 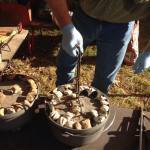 What resources are there out there for folks interested in learning more about Dutch Oven Cooking? Are there specific websites or books you consider to be go to sources of information? 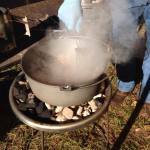 There’s all kinds of resources available today about dutch oven cooking. Google is your friend! There’s a lot of good books on the subject as well. 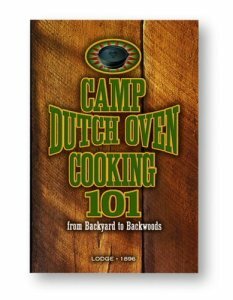 Most every dutch oven cookbook has information in it about heat management and taking care of cast iron, along with recipes. There’s also some good schools and clinics available. 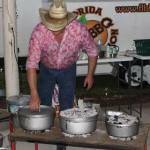 Are there any societies or groups out there that host regular Dutch Oven Cooking classes or competitions? If so, which are you favorites? There’s IDOS…International Dutch Oven Society. IDOS is the main membership body and sanctions contests held throughout the US. 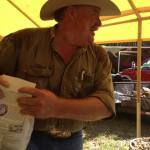 IDOS also puts on the holy grail of dutch oven competitions, the World Championship, in Utah ever year. 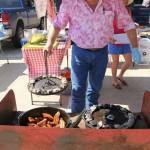 Most every state has a dutch oven chapter as well, some have one and some have more than one. In Florida, there’s the Cracker Trail Chapter. Most chapters hold DOGs, or Dutch Oven Gatherings, where everybody brings their pots and cooks their favorite dish and everybody eats good….kinda like a family reunion. If you had to choose one single Dutch Oven brand and size/style to use as sort of an all purpose go to piece of equipment – what would it be? It’s funny you should ask….I don’t know that I could pick a single one. 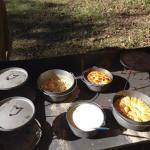 I cook on Camp Chef, Lodge, GSI, and MACA dutch ovens. Each brand has certain ovens that I like to use when doing particular things. I like the Lodge ovens because they cook really good and there’s a wide range of sizes for various jobs or dishes…I have them from 5″ all the way to 16″. 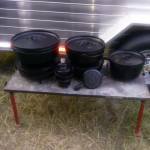 The Camp Chef ovens come in some different configurations that I really like. 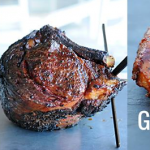 There’s the classic series, which is very comparable to the Lodge, the Deluxe series, which I like to use for certain things, and the Ultimate Dutch Oven, which has two cooking levels and also sports an enhancement kit that allows it to cook meat, vegetables, and bread all at the same time. The GSI ovens are cast aluminum, and they last few years. I’ve come to fancy them pretty good because of the ease of cleanup. 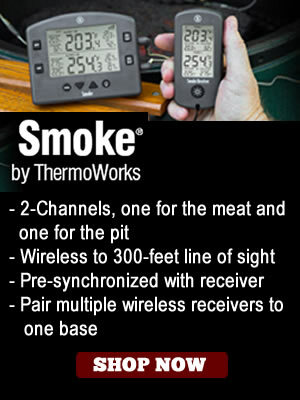 They also heat up really fast and cool down fast…which is a real advantage on certain dishes. When I have a big crowd to cook for, the MACAs do the trick. MACA is an accronym…meaning Big Assed Dutch Oven. 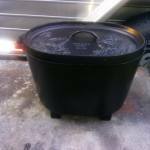 The 19″ MACAs I have each have a capacity of 29 quarts, and the big oval I have will easily roast a 20 pound turkey. 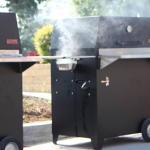 My favorite oven out of the 100+ that I have, is the very first one that I got….I reckon it’s just sentimental to me….the Lodge 12″ deep model. I recommend this model a lot of times to first time purchasers ’cause if they find they don’t like that form of cooking it can still be utilized on a fish cooker, is pretty good making stew, chili, frying, and stuff like that. 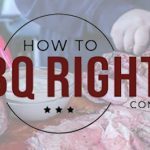 Are there any other tips, tricks, or must know pieces of information related to Dutch Oven Cooking you can think of that people truly interested in this manner of food prep should know? 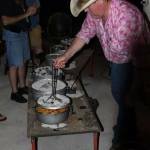 One of the best tips I can give somebody about dutch oven cooking, whether the person is a beginner or an experienced dutch oven cook, is to be aware of your heat. There’s nothing magical or mystical about dutch oven cooking…it’s only a different form of heat management. If you are unsure about the heat being too high or too low, always go for the low side. 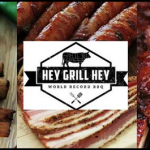 If you have the heat too high and burn the food…it don’t get no better…it’s all downhill from there. If the heat is a little bit too low, it’s alright and don’t worry about it….it’ll just take it a little while longer to cook and everthing’ll turn out just fine. The dutch oven is probably the most versatile piece of cooking hardware ever made. 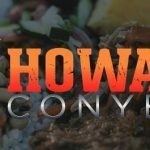 It’s a common misconception that it’s only for camping and cooking stew, chili, and other similar types of food. 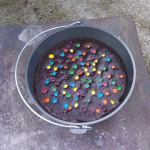 A good dutch oven is a valuable thing to have whether you’re cooking outside, in the oven, on the stove, in a toaster oven…pretty much anywhere EXCEPT a microwave oven. Anything can be cooked in it, from stew, biscuits, and cobbler…to more delicate things like kurbota pork, brioche, and cheesecake…the possibilities are endless! 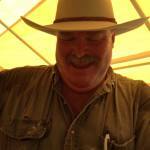 Help Say Thank You to Forrest Dilmore for Providing His Comments Here! 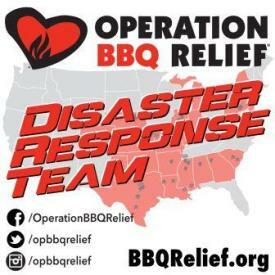 Though you’ll see links in this post to Amazon for purchasing dutch oven cooking implements, I do ask that you consider contacting Forrest Dilmore directly to buy either Lodge or GSI Cast Iron Cookware in any quantity. He’s been very generous with his time, so it’s a way for us to say thank you! Generally, you can get Lodge and GSI stuff from Forrest more cheaply than from an online or retail location. Another benefit in buying direct from Forrest is that you get his support and direction! 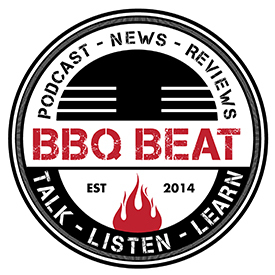 Great cast iron cookware AND expert advice and support! Hard to beat that! Well, there you have it! I love talking with Forrest, and you can tell by the way he lays it out in his Dutch Oven cooking comments above that he’s just plain fun to talk with. 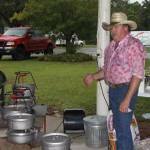 Forrest mentioned a few different dutch oven manufacturers that he uses for different reasons. Below, I’ve provided some information on each of these brands so that you can become a bit more familiar with them. 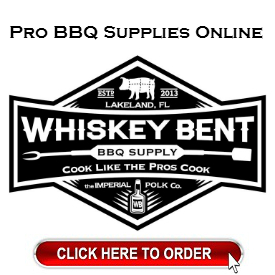 There are few brands in the outdoor cooking or campfire cookware manufacturing world that carry the heft of the Lodge Brand. For y ears and years, Lodge has and continues to produce cast iron cookware that’s affordable, reliable, and just plain works. You know I like to provide videos here as much as possible. 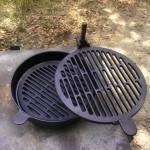 As such, I invite you to watch this overview video from the Lodge Cast Iron company. 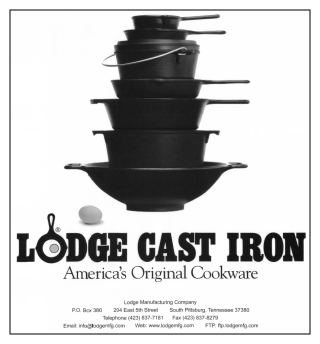 For nearly 115 years now, Lodge has and continues to provide reliable cast iron cookware. 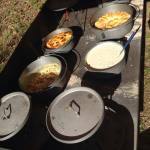 Lodge is the only cast iron cookware manufacturer that is both US based and manufactures in the United States. See more Lodge Cast Iron on Amazon.com here. 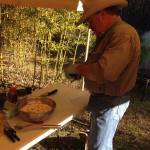 Take a look at the Lodge Camp Dutch Oven Cooking 101 Book here. If buying American is important to you, you can remain confident that buying Lodge cookware fits the bill. As Forrest suggests above, you can’t go wrong with a 12″ Lodge Cast Iron Deep Model skillet. 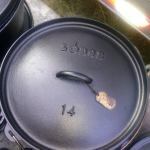 A great way to start your cast iron cookware collection. You can get the lid for it here. 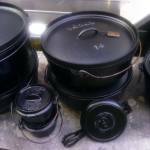 Looking for a Lodge Cast Iron Dutch Oven? Consider starting with this one here. 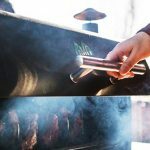 If you’re interested in the other dutch oven cooking models Forrest mentioned in this article, know that MACA has discontinued their line of Dutch Ovens as of about two years ago. 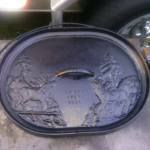 GSI Dutch Ovens is probably the other brand to look for. They sell hard anodized ovens. You can find their aluminum ones here. 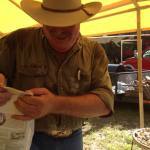 There are a ton of videos on YouTube on seasoning and caring for Dutch Ovens. I like this one on seasoning your Dutch Oven from the Jas. Townsend and Son, Inc. company. They do some cool historical reenactment stuff, which I’ve been a sucker for ever since visiting places like Williamsburg and Jamestown, VA as a kid. I also really like the following video from these guys as it introduces a cool little tool – the Forged Salamander. If you are familiar with restaurant cooking equipment, you’re likely familiar with the gas powered or electric powered salamander – used to brown off dishes and give them a nice crust and what not. 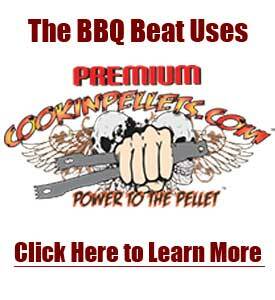 This little cast iron tool does the same thing, only in Cast Iron Cooking fashion! 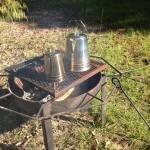 You can find this item and other cast iron cooking items for sale via the Jas. Townshend and Son website. 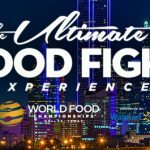 Find This Post Useful? Please Share! 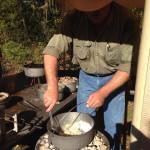 If you’ve enjoyed this post or found it useful in any way, please do consider sharing it with others who might also want to learn a bit more about Dutch Oven Cooking. 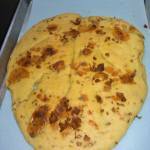 Have a recipe or resource to share here? Please do so in the comment area below!